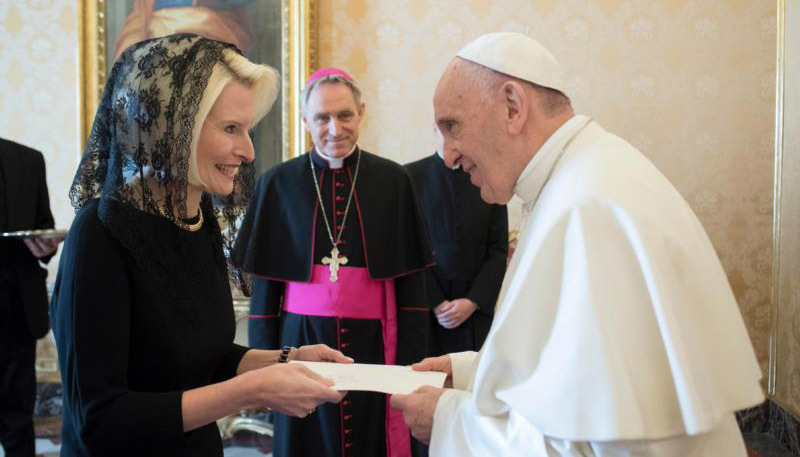 VATICAN CITY (CNS) — Callista L. Gingrich presented her letters of credential to Pope Francis, formally assuming her duties as U.S. ambassador to the Holy See. Gingrich met privately with the pope Dec. 22 after introducing her husband, former House Speaker Newt Gingrich, and members of her staff. After meeting the pope and Cardinal Pietro Parolin, Vatican secretary of state, the new ambassador was accompanied to St. Peter’s Basilica by Msgr. Francis Kelly, a priest of the Diocese of Worcester, Massachusetts, and a canon of St. Peter’s Basilica.